Yesterday (monday) I started my training program for USPA Powerlifting Nationals on July 8th, in Las Vegas, Nevada. I’ll be competing as a 198, classic raw (knee wraps), in the Open age category. 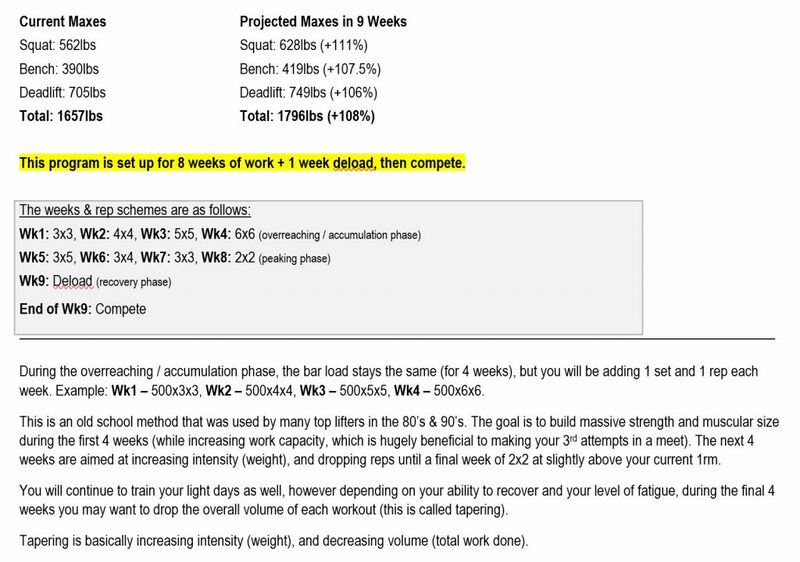 Last week I tested my maxes, then took a deload week. My maxes were 562lb squat, 390lb bench, 705lb deadlift for a “1657lb total”. I put this in “” because they were not done on the same day. 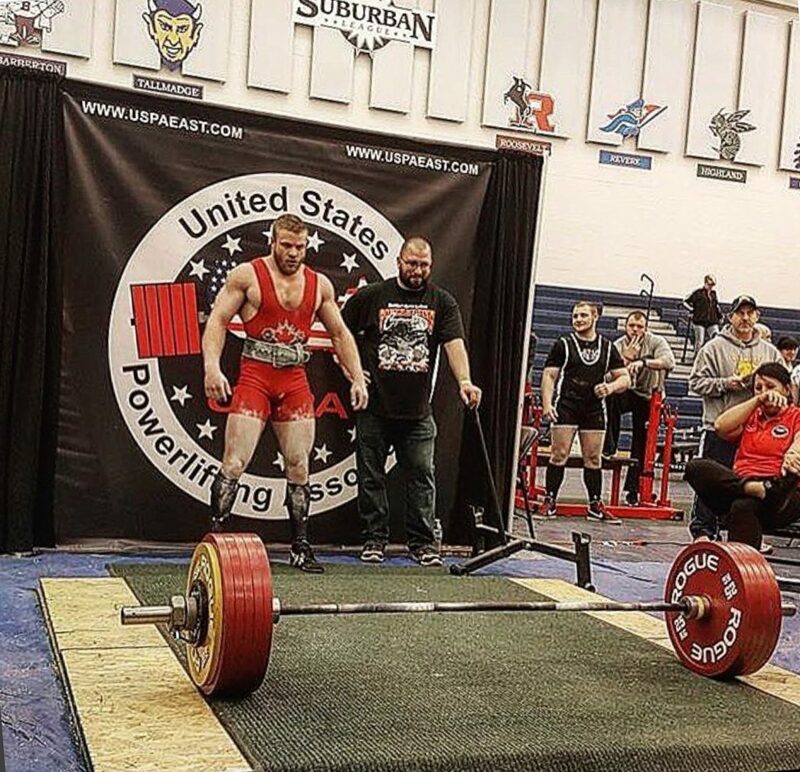 The current All-Time Total Record (Canadian) at 198lbs is 1791lbs (Amit Sapir). I feel that this is within reach if I do everything right over the next 9 weeks. Normally I use Instagram as my “training log” – meaning I post a video (usually my top set for the day), and a short write up so next time I go to do that same lift, workout, or day – I can easily scroll back and find what I need. I’ve decided to post my training here each week for the next 9 weeks – for anyone who wants to follow along. 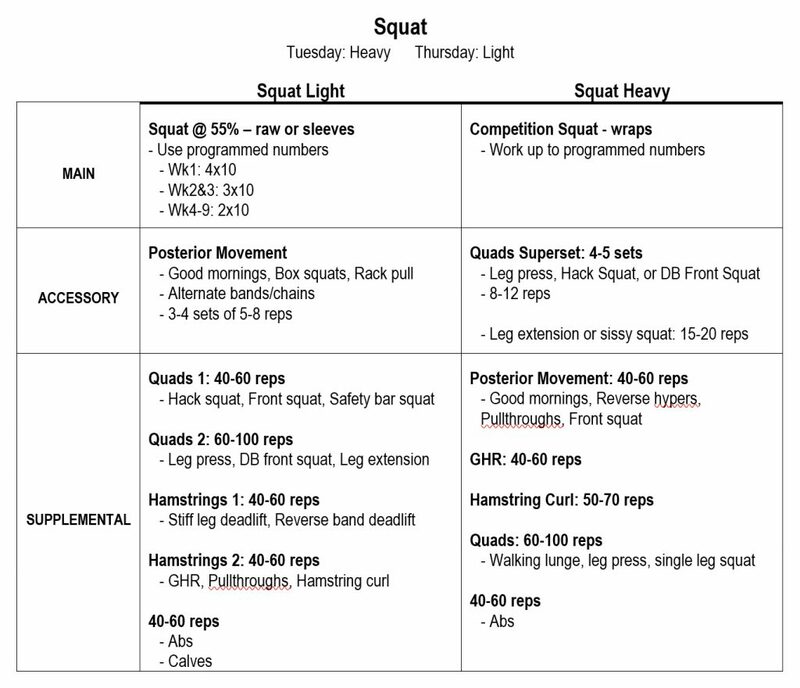 The individual workouts will be on my Instagram as usual, but my weekly layout will be posted here. The first 4 weeks are an old school method used by many top lifters in the 80’s & 90’s – building from a 3×3 to a 6×6 with the same weight (an increase of 27 reps). The next 4 weeks are the peaking phase where we drop reps and increase intensity, followed by a deload week, then a contest. The first 4 weeks will build work capacity and muscular size, which have a huge impact on making 3rd attempts at a meet. We’re also moving away from the standard rep schemes (3×10, 5×5, 4×6..etc), instead were using total reps (example: 60-80 total reps). This allows the lifter to regulate fatigue through training, and adjust the intensity (weight) day to day. If it’s a movement we want to go heavy on, we may do 8 sets of 8 (64 total if the reps are calling for 60-100 total), or we may do 6×15 (90 total) if we want to pump blood while reducing the intensity (weight). Squat training is broken up into two workouts per week – one light and one heavy. During our light days, the bar weight stays the same, and you will be performing 2-4 sets of 10 to start the workout. This is to allow you to work on technique and build work capacity. This day will also be done raw or in sleeves. Our heavy day is done in wraps (if you don’t compete in wraps and you’re missing reps, reduce the weight by 5%). 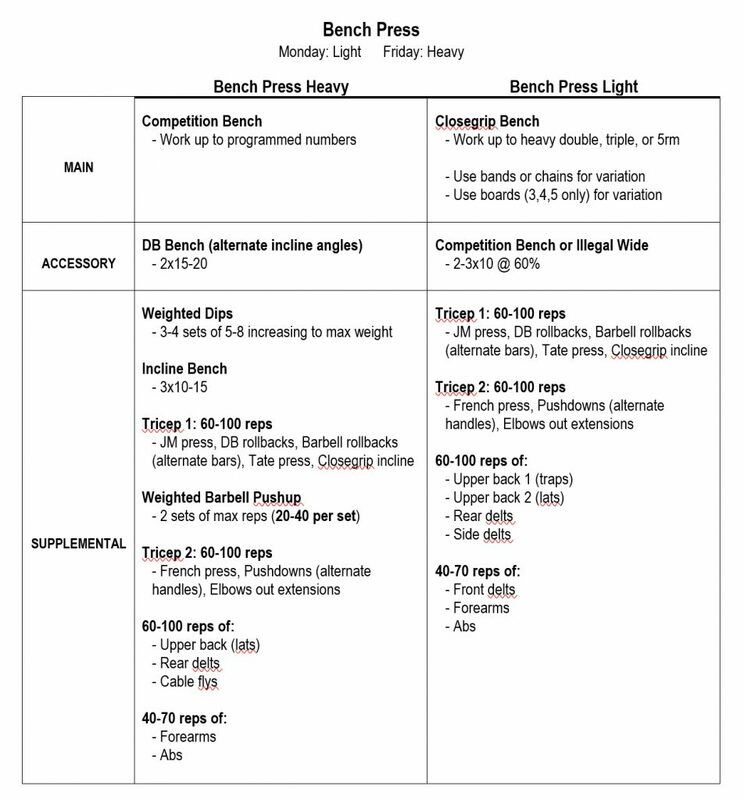 Benching is also done as a heavy day and light day. On heavy days, we work up to our programmed numbers, then move into heavy tricep and chest work. We only train chest directly once per week (on this day) with 6-8 sets of 10-20 reps. The rest of our pressing work is focused on building strong triceps and back. On light days, we work up in a closegrip bench to above 90%, with a variation of chains, bands, or boards. This is to overload the triceps and build lockout strength. We still hit 2-4 sets of 10 on competition grip or illegal wide bench to keep the pecs stimulated and work technique. Main movements for this training cycle will be JM Press, french press, and heavy pushdowns to build the “medial” head of the triceps (lockout strength). Deadlift is pretty straight forward. Our programmed numbers will be done in competition stance (sumo or conventional), and accessory work will be targeted at weaknesses. 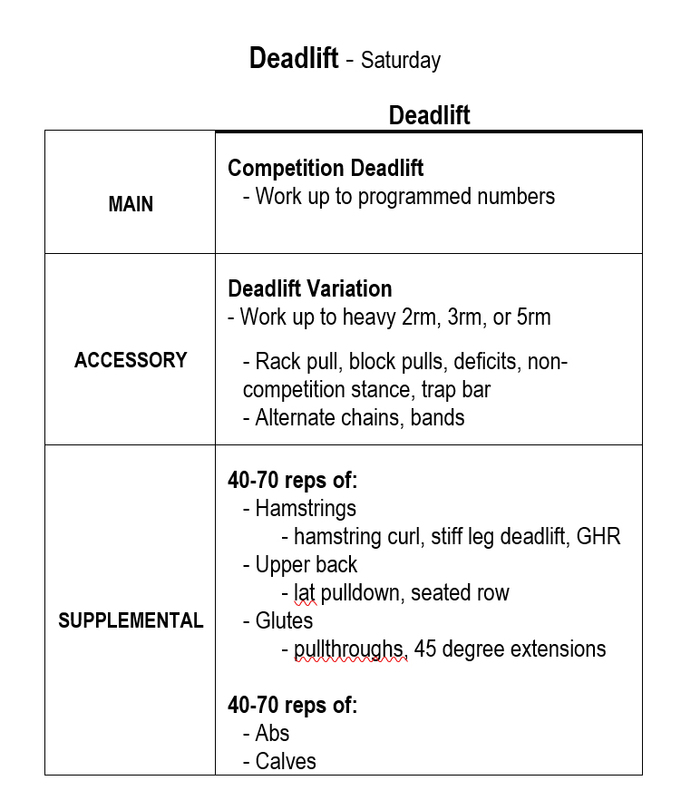 We only deadlift once per week (depending on fatigue and recovery towards the end of the program, I may skip a deadlift day or two as I perform better when I deadlift less often). This is shaping up to be the hardest, and most intense training program I’ve ever started. I find that if I focus too much on the end goal (hitting the total), my training suffers because of the stress I put on myself. This time around I’ll be focusing day-to-day, doing what needs to be done. The plan is set, the numbers are doable, and all that remains is to hit each day with intensity. Small improvements over time = results. I hope you gain some knowledge from this, and can take the ideas and implement them in your own training. As always, if I can help in any way – email me.